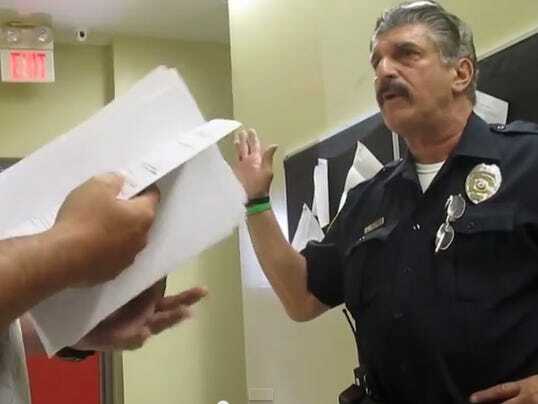 HELMETTA – Richard Recine's 36-year career as a police officer came crashing down this week after he was caught on camera saying police do not have to follow the Constitution because President Barack Obama doesn't either. On Thursday, Recine — who had retired from the Franklin police force in 2006 and was working part time here as a special police officer — submitted his resignation. "I don't want to give a black eye to law enforcement," Recine, 59, said Thursday in an exclusive interview with MyCentralJersey.com. "People are saying some really nasty stuff about cops. I don't want all officers painted with the same brush." Borough Administrator Herbert Massa said the resignation was accepted by Police Director Robert Manney, who had called Recine's comments an "embarrassment." The video first was reported Wednesday by MyCentralJersey.com and the story quickly went viral. The story was picked up by the Drudge Report and was the top story Thursday morning on the online community news website Reddit. Many readers were upset that Recine's comments were dismissive of civil liberties. In the video, taken Monday at the borough's Municipal Building, Recine tells resident Steve Wronko that "Obama has decimated the friggin' Constitution, so I don't give a damn," after Wronko insists he has a constitutional right to take pictures inside the building. But on Thursday, Recine, a registered Democrat who serves on the elected Board of Fire Commissioners of District 2 in Piscataway, said he was being "sarcastic." "It was just a stupid statement on my part. He got me riled and I said it," he explained. "I don't believe that at all. I'm the most patriotic person in the world. I believe in God, the flag, country, the Constitution." Recine said he was dispatched to the building because municipal workers were concerned when they saw Wronko taking pictures indoors. Wronko and his wife have been campaigning for reform of the borough's animal shelter. They said police have asked them to stop taking pictures and videos outside the animal shelter twice before this week's incident. "I tried to explain to him that since 9/11 you just can't walk into a place and take videos," Recine said Thursday. "All he kept on doing was saying he had civil rights, and the Constitution, and he didn't have to give me information. And I kind of like lost my temper." Manney said police were right to question Wronko and to ask him to leave the building but said Recine's comments about Obama and the Constitution were inappropriate. Recine said the decision to hand in his resignation was "mutual."